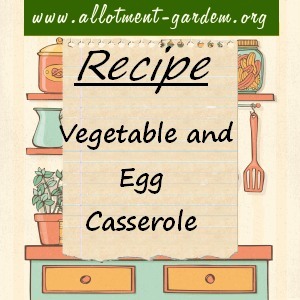 Use up some bits and bobs of cooked vegetables in this filling casserole dish. Dice carrot and potatoes, chop chives and sauté all the vegetables and chives in 2 oz (56 g) butter. Put into a buttered casserole and cover with slices of peeled tomatoes. Heat remaining butter in a pan, add flour and mix well. Add milk and stir until boiling. Separate eggs, stir yolks into the sauce and add seasoning, nutmeg and cheese. Beat the egg whites stiffly and fold into the sauce. Pour over vegetables and bake at Gas Mark 6 (400°F/200°C) for 25 minutes.